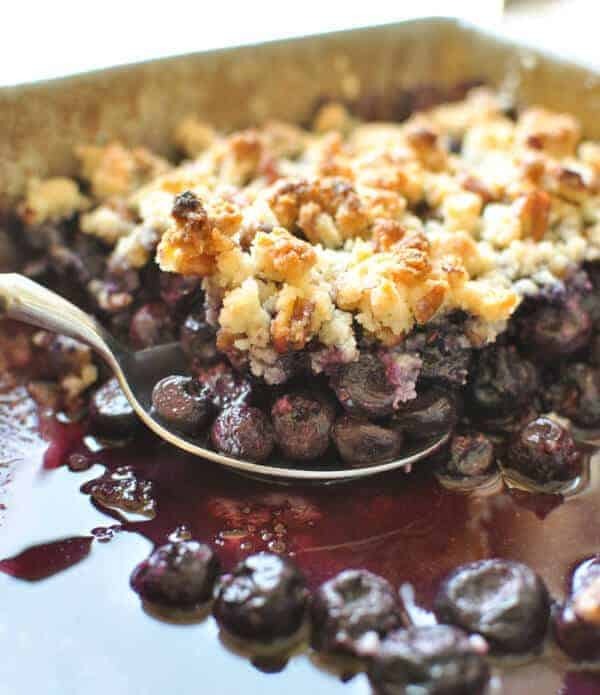 This Paleo blueberry crisp is wonderful anytime of the year. In the summer, you can use fresh blueberries and the rest of the year, use frozen blueberries and think back on all the lazy days of summer. 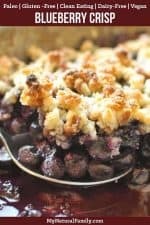 You’ll love the contrast of the tart, soft blueberries with the crispy, slightly sweet almond flour and nut crust. Well…It’s official, school has started, and I am not happy about it on so many levels. First, being a parent of a student is more work than being a student (at least I think it is :)? It would seriously be so much easier to do college-level homework than to try to get my children to do their homework…don’t we (as adults) graduate from school so we would be done with homework…forever :). Second, I am not ready to give up on summer. I LOVE fall, but fall means winter is just around the corner…and I don’t love winter…so I like to hang on to summer as long as possible, just to stall winter! In my attempts to stall winter, I made this super delicious summertime dessert – – and guess what, I think it is working. I think I am stalling winter – at least for a little while. Regardless of your motives, I highly recommend you whip up this super-simple and delicious Paleo blueberry crisp dessert. It is made with all-natural ingredients, is Paleo and Vegan-friendly, is full of all sorts of nutrients and antioxidants, and tastes divine (not to mention it helps stall winter)!!! 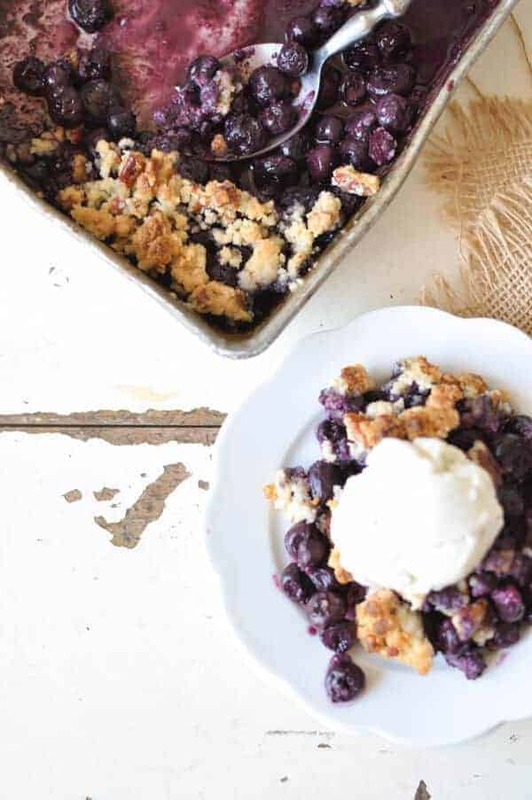 This crisp is LOADED with blueberries, which I think is fabulous…but if you like a more even blueberry to crust ratio, feel free to decrease the filling ingredients by half and watch your baking time. I was asked this question the other day, “do you ever eat treats?” The answer to that is, of course, I do, but if you were watching me eat in public, it looks like I don’t. Two reasons – #1 I don’t eat non-Paleo treats ever. #2 – When I do eat an occasional treat, it’s usually to test them for this blog or for a special occasion and I don’t usually eat them in public. I don’t eat them on a regular basis. I do much better, and feel much better when I eat treats every once in a while, rather than every day. It is what works for me, and I know there are many out there that do much better with a small treat every day to help keep them on track. I used to scour the internet to see what other’s were eating, and then try to replicate their exact meals, and guess what…it didn’t work. I had to find what worked for me through trial and error. Now I scour the internet to see what others are eating, so I can get some new ideas (and because I find it interesting). It is a much healthier mindset, and consequently, I am a much happier person :). So, here’s a question for you – how often do you eat treats on the Paleo diet? 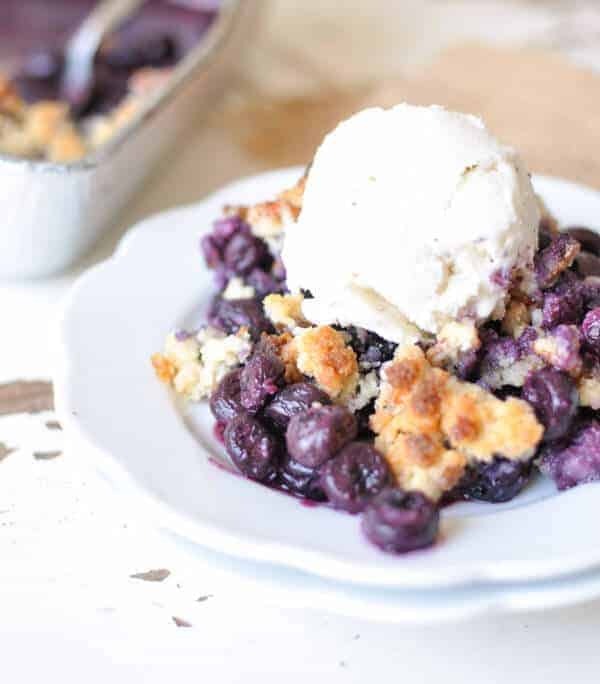 I would love for you to comment and let me know how often you eat Paleo desserts and I would also love to know if you like this Paleo blueberry crisp. Please comment below! 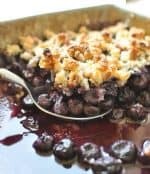 This super simple and delicious Paleo blueberry crisp is made with all-natural ingredients and is loaded with nutrients and antioxidants. It’s a perfect way to enjoy summer all year long! I adore blueberries so I’ll be trying this real soon! And yes, cabbage is so filling. Lately my breakfast has been a 1 egg and 4. Egg white scramble with tons of cabbage (coleslaw mix). I find it fills me for hours! It’s true, we all deserve a little bit of sweetness in our lives :-). Like you, I tried to assess others’ treats to figure out what was ‘okay’ in terms of treats but ultimately found what works best for me – independent from what others do. For me, that means eating little treats like a few squares of chocolate every day and larger ones – think scoops of ice cream out with a friend – every now and then. Isn’t it funny how trial and error is sometimes the best method :-).